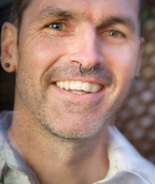 Keith Hennessy is an awardwinning performer, choreographer, teacher and organizer. He was born in Canada, lives in San Francisco and works often in Europe. His interdisciplinary research engages improvisation, spectacle, ritual and public action as tools for investigating and revisioning political realities. Alone and with others, Hennessy makes politically engaged, soul touching performance for humans. Keith Hennessy began Contact studies in Montreal in 1979 with Dena Davida, Catpoto, Andrew Harwood, and began teaching in 1982. Keith trained & evolved as an improviser with Terry Sendgraff and Lucas Hoving & then several amazing years with Sara Shelton Mann and CONTRABAND. He has learned more in rehearsal, jam, and performance than in classes. Keith continues to explore Contact/Improvisation within a context of interdisciplinary performance action, spectacle, and ritual. Hennessy directs Circo Zero Performance and is a PhD student at UC Davis. He was a member of the collaborative performance companies: Contraband (85-94), CORE (95-98), and Cahin-caha, cirque bâtard (98-02). His work is featured in several books and documentaries, including How To Make Dances in an Epidemic (David Gere, Univ of Wisconsin: 2004), Gay Ideas (Richard Mohr, Beacon: 1992), and Dancers in Exile (RAPT Productions, 2000). Hennessy is a co-founder of 848 Community Space/CounterPULSE a thriving performance and culture space in San Francisco. Recent awards include a Goldie (2007) and the Alpert/MacDowell Fellowship in Dance (2005). Recent commissions include Arsenic, Lausanne (Crotch, 2008), Centre Chorégraphique National, Belfort (Sol niger, 2007), Les Subsistances, Lyon (Sol niger 2007, Homeless USA, 2005), Les Laboratoires, Paris (American Tweaker, 2006), FUSED (French-US Exchange in Dance), and Lower Left Performance Co, San Diego (Gather, 2005). Keith’s 2008 teaching includes UC Davis, Orvieto (Italy)/ Zipfest, Vienna/imPulsTanz, Moscow/TSEH, Montreal/Circuit Est, Toronto/IDA, Chicago/NPN-Columbia College, and talks at CI36 events in Berlin and Juniata College PA. In 2009 Crotch will tour to DTW/New York and TNT/Bordeaux and hopefully San Francisco. Improvisation as potential shamanic action. Entertainment, art, ritual, practice, pedagogy, performance. Contact Improvisation is our home base for metaphoric and embodied travel through the fields of performance, intimacy, risk, ritual, community, and action. To perform improvisation is to perform both the process and the promise of creativity. We make something and give it away, simultaneously. The workshop will explore the tendency towards entertainment as well as the critiques of virtuosity and spectacle. And we will experiment; we will play like scientists, like alchemists, who mix ingredients just to see what will happen. Religious intentions of awareness, transformation and revelation encounter political goals of diversity, consensus, freedom.